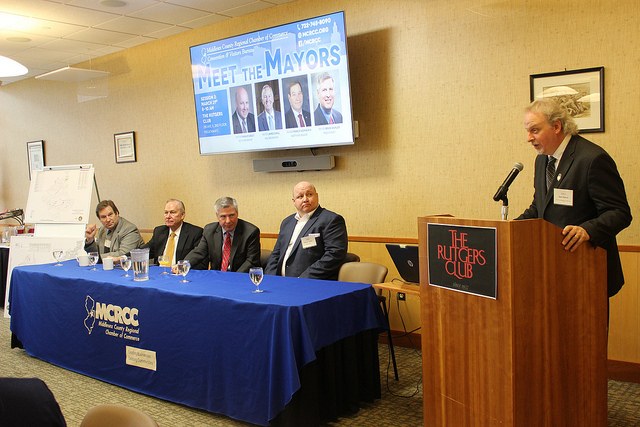 Members got the chance to meet their mayors at MCRCC’s “Meet The Mayors, Part 2” on March 21 at the Rutgers Club in Piscataway. Mayor Francis Womack of North Brunswick took the mic first to explain all that is happening in North Brunswick and what residents can look forward to down the road. Mayor Brian Wahler of Piscataway, Mayor James Cahill of New Brunswick and Mayor Charlie Carley of South Brunswick then went on about travel and tourism and the importance of travel in central New Jersey. Other topics that were touched included arts and culture, economic development and going green/sustainability. Members asked the Middlesex County Mayors about economic development opportunities for businesses and more of what is to come in the future. Many members were fully entertained by this year’s moderator, Bert Baron, talk show host for WCTC-AM in New Brunswick.